Pierogi. Eastern Europe’s contribution to the world’s dumpling party. If you like dumplings, you’ll love pierogi. If you don’t like dumplings, there’s something wrong with you. It’s believed that the idea of dumplings came from China, through the great Asiatic steppes and into Europe. This may well be true, given that pierogi are a lot like Chinese potstickers. There are records of Pierogi in Poland back to the 1200s, and even back then one of the main fillings was mushrooms. You’ll find many more articles on identifying, processing and cooking wild mushrooms here! Now I don’t know if you know that much about Eastern Europeans, but virtually every one I’ve met here in America at the very least likes mushrooms, and most actively pick them, too. I’ve seen platoons of “Russian” — I have no idea where they actually were from, but they always speak a language that sounds like Russian — pickers in the woods, collecting mushrooms that most of us Anglo pickers won’t touch. I am betting at least some of these shrooms go into homemade pierogi, or piroshki, which is a Russian dumpling a bit more bready, like an empanada. 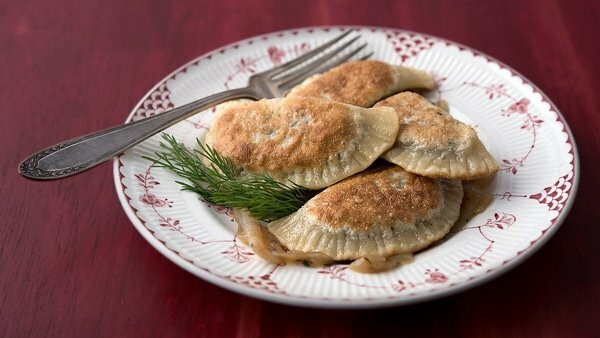 This pierogi recipe is great to make when you have only a few of each sort of edible mushroom, too, as you’re going to chop them anyway. Got a few morels and a couple dryad’s saddle? Maybe one porcino and a bunch of pine spikes or chanterelles? Go for it. Don’t pick mushrooms? No problem. Mix and match supermarket mushrooms. I like using those “chef’s sampler” packets for pierogi. Or just use common button mushrooms. It’s a dumpling, people. Do what you like. You can eat them however you want, but I strongly urge you to boil them until they float, then fry them in lots of unsalted butter. Served with caramelized onions, a big dollop of sour cream and some dill, washed down with a dark beer, and you will understand why they’ve been making these things for 800 years. Pierogi are idiosyncratic dumplings. You can fill them with pretty much whatever you want, make them as large or small as you want, alter the dough and either boil or fry them... or both. Mushroom pierogi are a very common thing in Eastern Europe, as the various Slavic nations tend to be serious mushroom eaters. 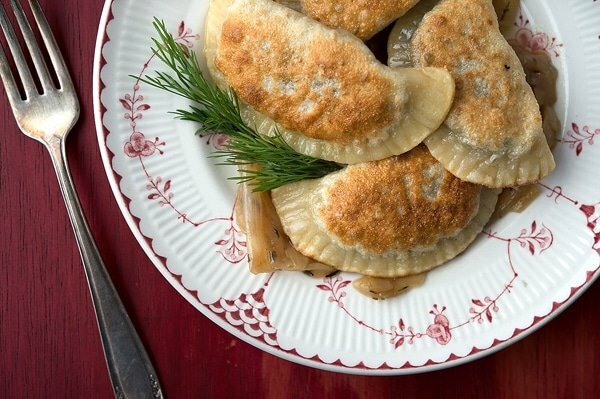 These pierogi are made with fresh porcini and reconstituted black trumpet mushrooms. 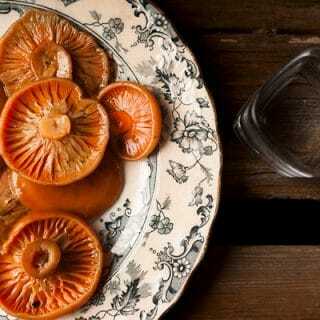 But you can do this with pretty much any mushroom you'd want to eat. I like having two different kinds for variety, but you could do fresh and dried morels, for example. Make the dough by mixing all the ingredients together in a large bowl. Knead the dough until it comes together as a sift, silky dough, about 5 minutes. Cover in plastic wrap and let the dough sit on the counter for an hour or so. You can refrigerate it up to 2 days. To make the filling, chop the fresh and dried mushrooms and add them to a large saute pan with the minced onions. Turn the heat to medium-high and saute until the mushrooms give up their water, about 2 to 5 minutes depending on the mushroom. Salt them well. When the water from the mushrooms has almost evaporated, add the butter and saute until everything begins to brown, about 4 to 6 minutes. Add the garlic and cook another minute. Turn off the heat and let the mixture cool for a few minutes. Add the contents of the pan to a food processor, along with the dill or parsley. Buzz to make a fine crumble, but not a paste. You want some texture in the filling. Put the contents of the food processor in a bowl and mix well with breadcrumbs. Add salt and black pepper to taste. To make the pierogi, roll the dough out by hand -- it's too soft for a pasta roller. And you don't want it too thin, either. About 1/8 inch is good. The reason is you stretch the dough when you make the pierogi. I use pastry cutters to make my pierogi, but you can use a glass or you can cut out squares. How wide is up to you. I used a 3-inch round, which makes smallish pierogi that are a bit more like potstickers in size. Everyone's pierogi are different shapes and sizes, so go for whatever floats your boat. 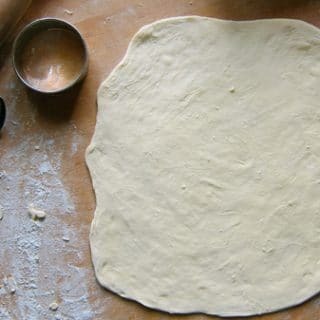 Take the round of dough and stretch it a little evenly all around, like you would with pizza dough. It doesn't have to be too stretched out, but a little helps. Hold the dough in the palm of your "off" hand. 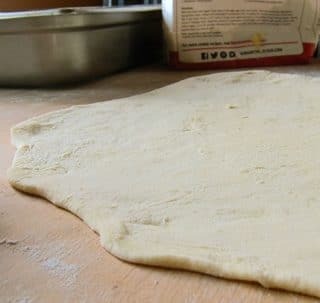 Put a teaspoon, tablespoon or whatever seems to fit in the center of the dough -- you can fill pierogi more than you can with Italian pasta dough because it's so flexible. Fold the dough over the filling. 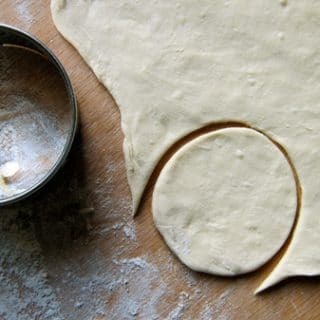 I start at the center and work towards an edge, stretching and pinching the dough at the rim of the dumpling as I go. Finish by sealing the other edge. Set the dumpling on your well-floured surface and seal it tight by crimping with the tines of a fork. 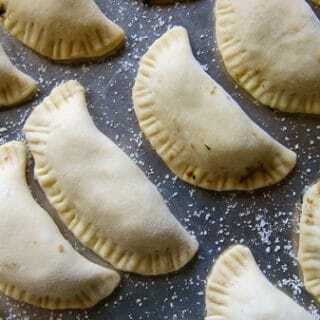 Set your finished pierogi on a baking sheet that you've dusted with either semolina flour or cornmeal. Pierogi are pretty moist, so they don't do too well stored uncooked, unless you freeze them right away. To freeze, put the baking sheet in the freezer (or a plate if the whole sheet won't fit), then, when they are frozen, you can put them in a freezer bag. Normally I cook pierogi shortly after making them. You can either simply boil your pierogi until they float -- I give them another minute once they float, too -- or you can double cook them, which is what I prefer. To do this, boil until they float, then fry in lots of butter. Serve with caramelized onions, sour cream and dill. You can find dozens and dozens of recipes for all varieties of mushrooms here on Hunter Angler Gardener Cook! Vincent: Because it is. 😉 Seriously, the ratio is just a guide. I wanted a more flexible, soft dough here that I could form more easily. Made them last night! Amazing. Used baby bellas and chantrelles… very tasty. I didn’t chill the dough, left on the counter. Will chill next time as the dough is resting. I also need to make my rolled out dough a bit thinner – some of the pressed edges were a little too thick for me. The caramelized onions are called “skwoarkay” (pronunciation) in Ukranian, they are chopped onions fried in pork fat, sometimes with some chopped pork meat, common to Polish folks too. All slavic peoples had some form of animal fat cooked with fruit or vegetable as a condiment: Deutsch have greben-schmaltz, pork fat rendered and having crackly fat, nice spread on bread; Jewish people saute diced apples in chicken fat. Grandma never used to seal her perogy edges with a fork, she just pressed the edges together with her fingers, I remember watching her doing this with a cigarette hanging out o her mouth. We rarely fried our perogies, they were just served hot from being boiled in the pot, not filled with mushrooms, filled with potato/cottage cheese or sauerkraut. Ukranian, Polish and Czech people like to eat Honey Mushrooms common in the fall, but they also enjoy Morels, Chanterelles and Lobster Mushrooms. Just because the other foragers have a foreign language, don’t call them Russian. Its like calling a Canadian an American or an Aussie a Brit, possibly even more of an insult. My ciocia Helen made her dough without the use of sour cream – interesting. Will have to try it this way. She didn’t use a fork to seal them – used farmer’s cheese and potatoes inside as most of our family are fungiphobes (save for me – I pick locally). She would boil them and then just top them with butter and sour cream. Me? I stuff mine with mushrooms, farmer’s cheese, boil, fry in butter and then top with sour cream.